David Hunt Lighting British made Flemish 15 light ceiling fitting exhibits a timeless display of historical dutch artistry, packed with the distinctive and elegant style that has made this design so popular and long-standing. Completely hand-crafted and finished using traditional manufacturing techniques in Britain, this a truly unique and inspiring range. 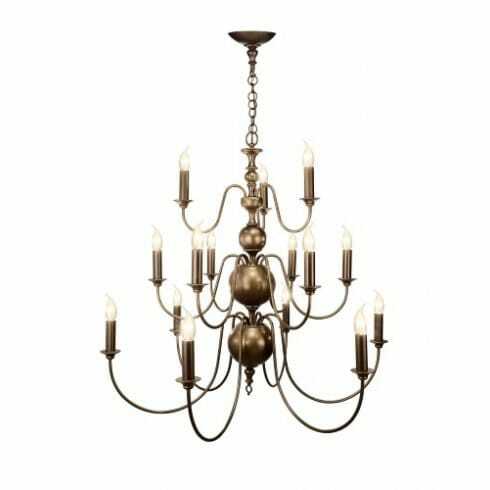 The product code for this David Hunt chandelier is FLE1563. It features the quintessential central baluster, with alternating wide and narrow parts, and the two-tiers of long, scooping arms that define a Flemish chandelier. The arms are topped with traditional sconces and candle holders for that classic look, while the matt bronze finish adds subtle, antiquated charm.